Coulter recently gave a stunning description of the GOP base. She claims it is a “teeny, tiny base” composed of religious zealots and extremist pro-lifers! Using her recurring ugly stereotype on the Nowman Show (6/25/16), Coulter argued, “[Trump] doesn’t have religious ecstasies on stage. He doesn’t speak in tongues.” Coulter will say anything to destroy Cruz. Sadly, time after time, Coulter attacks Christians for behaving as Christians are supposed to behave – in a godly manner. Why? Political expediency? To justify her own ungodly behavior? Coulter hated every GOP candidate but Trump – who isn’t even a Republican! Moreover, her mission was and remains to destroy the GOP. Coulter’s latest broadside against the GOP base is in keeping with her ultimate goal. She does, after all, want to form a New Trump Party. An avowed pro-lifer, Coulter has berated and defamed pro-lifers for nearly two decades. A fierce opponent of Obamacare, now Coulter is ready to embrace Trumpcare. Once an advocate for federalism and limited government, Coulter now shills for a statist who would wield his own pen and a phone. A self-proclaimed constitutional attorney, Coulter defames the only constitutionalist running for president while championing the only “Republican” running against the Constitution. A virulent anti-immigration, anti-amnesty activist, Coulter defends Trump who did and does support amnesty. This is Coulter’s signature issue – her obsession – and she backs someone who unquestionably supports amnesty while she continually thinks he doesn’t. Coulter is lost in her own little world into which she won’t allow reality to enter. Who is really surprised? Coulter has been supporting RINOs and spouting propaganda for years. Now she has gone incredibly far over the edge, losing more and more credibility. 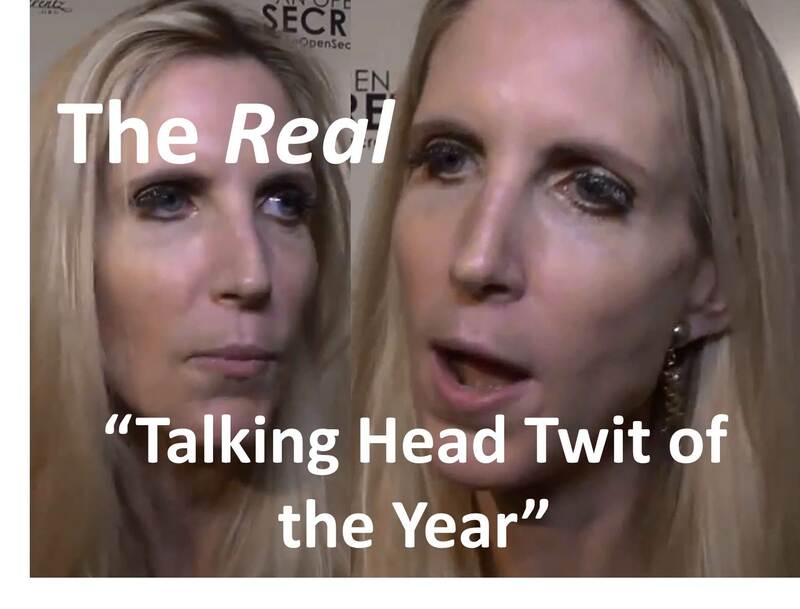 Will the real Ann Coulter please stand up! Last Friday, Ann Coulter launched yet another tirade against conservatives for being pro-life. 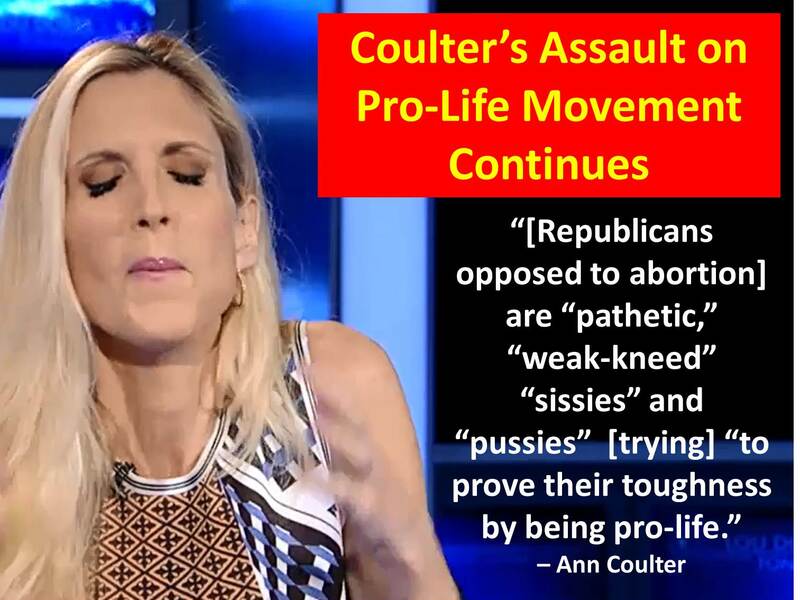 In other breaking news, Coulter claims to be totally pro-life herself. How obtuse can one get? I have lauded Coulter’s intelligence and craftsmanship in the past, but her hubris has blinded her to reality. 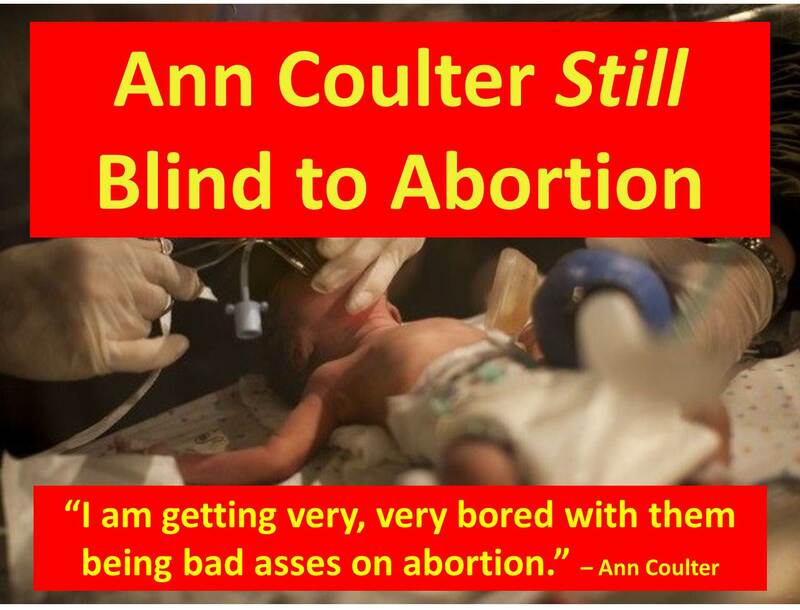 The implication in her choice of words (“bad asses”) suggests, as she has often done in the past, that present-day politicians currently in office who are pursuing a pro-life agenda are engaging in political posturing. Yes, she is impugning the motives of those she condemns. This is classic Coulter, who denigrates all those who disagree with her. During the 2012 election cycle, Coulter besmirched all those who opposed her hero, Mitt Romney. Now, she belittles all those who endanger a Donald Trump candidacy. To do so, Coulter frequently attacks their motives and character. Victory would mean that abortion has been eradicated. Remember, Coulter is attacking conservative politicians (and presidential candidates) who are fighting for the unborn. Coulter is chastising them for seeking to defund Planned Parenthood. Coulter is lambasting them for doing what they are supposed to do: represent their pro-life constituency. The pro-life cause has been given new life – on a national stage – due to the heroic efforts of the Center for Medical Progress, which, through a series of investigative videos, has exposed the truly evil nature of the “medical procedures” being performed by Planned Parenthood. For perhaps the first time in our nation’s history, We, the People of the United States, have before our eyes the graphic evidence of a baby holocaust in America. And Coulter would have pro-lifers do nothing! No! Pro-lifers are seizing the moment to seize the victory which Coulter contends we have already won. Victory, in Coulter’s view, is to have Republicans who profess to be pro-life. But the moment they start to put into practice their pro-life principles, she condemns them. 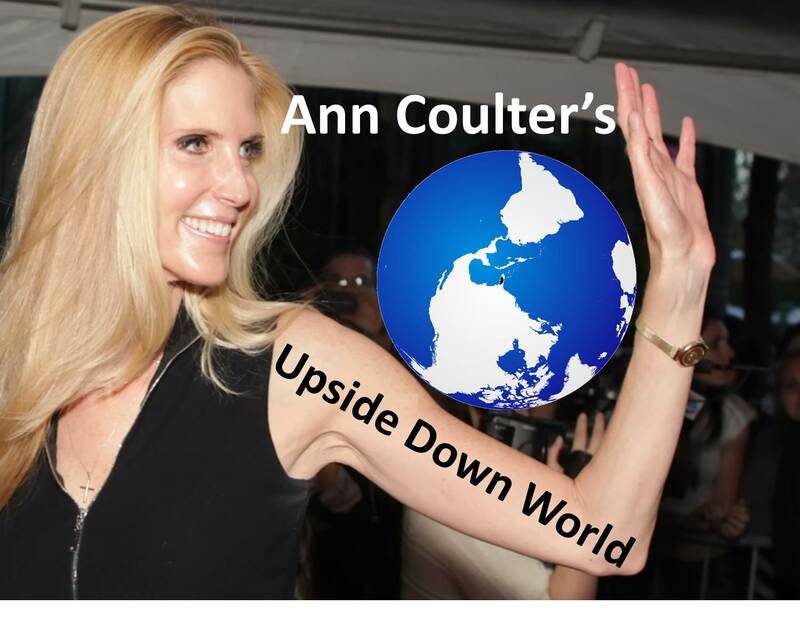 Few people regard Coulter as a principled conservative because, over the years, she has proven herself to be without scruples. Principles come and go, but Coulter’s career must continue. During the last election cycle, Coulter attacked the Tea Party for seeking “ideological purity” and she urged voters to vote for anyone running as a Republican. After the election, Coulter discovered that RINOs will be RINOs. Still, Coulter acts as if only she is principled. 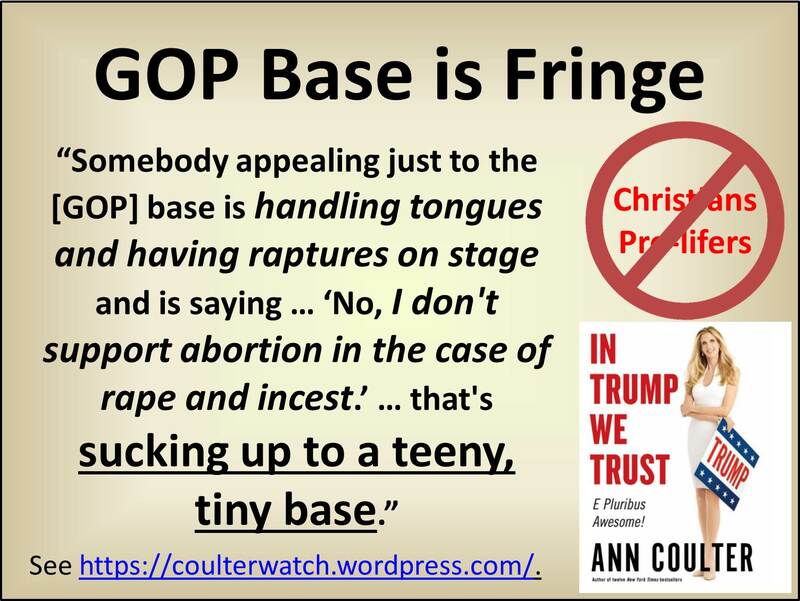 But if simply espousing pro-life principles without acting on them is sufficient for Coulter, then what can we expect from politicians espousing the current set of principles Coulter advises? And why have litmus tests at all if we expect them to be ignored? This is nonsense! As she has done since at least the 2000 election cycle, Coulter subordinates pro-life concerns to virtually everything else. She is a pro-life procrastinator, putting off till some perfect moment in time in the future what she should be doing today. The concept of fighting on more than one front at a time seems foreign to her. Somehow, the Allies in World War II managed to defeat enemies in both Europe/North Africa and the Pacific. Courage is required (the courage Coulter lacks) to combat abortion and immigration at the same time. This is the moment to which we have been called – and Coulter vilifies those who are answering that call. Speaking of illegal immigration, Coulter once joked, “The motto should be: There are way too many, and there shouldn’t be any. It even rhymes.” Coulter has repeatedly said that even just one crime committed by one illegal alien is one too many. If only Coulter would apply her immigration motto to abortion: “There are way too many, and there shouldn’t be any.” But, for Coulter, the unborn will have to fend for themselves. The 2,000 babies aborted every day will have to make do until Coulter’s immigration agenda is put into place. Anyone (in or outside the womb) who poses a threat to her new hero, the Donald, must be dispensed with, regardless of principle – or life. Ann Coulter, Kelly File, FNC, 7/23/15. Ann Coulter has been sacked by the Truth more often than RG3 has been sacked by the Detroit Lions. Coulter often does speak truth, but she all too often tells lies. Discerning between truth and lies can be problematic with Coulter. During her latest book tour, Coulter has told countless lies. Small lies. Big lies. Smug lies. Hurtful lies. Shameful lies. One tactic Coulter uses to present her propaganda (to promote herself and her agenda) is that of speaking with conviction. She will forcefully and vehemently lie with the expectation that her seeming conviction will convince others of her falsehoods. Whenever Coulter is confronted with facts she cannot refute, she will dismiss them or deny their veracity. Delusions of grandeur aside, Coulter cannot be trusted because she thinks too highly of herself and she regards her lies as superior to the truth that we all need to make informed decisions. 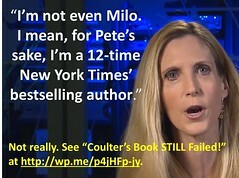 Throughout her book tour, Coulter has boasted about her superiority, praising herself and her book. Coulter is sacked by truth on a weekly, if not almost daily, basis. Until Coulter speaks the truth and sticks with the truth, Conservatives should not stick with Coulter. Alan Colmes Show, Fox News, 7/10/15. 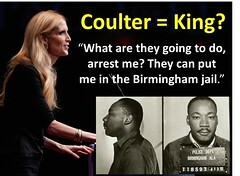 See “Coulter’s Loopy Logic” at http://wp.me/p4jHFp-7L. Ann Coulter, tweet, 8/12/15, 10:40 a.m.
 See “Coulter Hawks Hillary – Again!” at http://wp.me/p4jHFp-8P. Ann Coulter, Mike Gallagher Show, 8/18/15. Ann Coulter, tweet, 8/17/15, 9:54 a.m.
 See The Beauty of Conservatism, 2011, available as a free download at www.coulterwatch.com/vanity.pdf. Many laugh off Coulter’s tweets as jokes while others contend she has (again!) jumped the shark. Those who defend Coulter’s antics as humor neglect this reality: when Coulter jokes, she means it. Coulter means everything she says! she means it. Coulter literally does not care whether Trump performs abortions in the White House as long as he’s in the White House. Victory is all that matters to Coulter. Uncle Rico @AuburnJulia . @AnnCoulter @realDonaldTrump You’re sounding like a fourteen-year-old girl who has a mad crush on the high school weed dealer. jan boice @jkboice . @AnnCoulter @realDonaldTrump Shame on you, Ann. Abortion is NOTHING to JOKE about. Despicable. Although Coulter claims to be pro-life, she is manifestly not. Coulter once championed Mitt Romney as her political savior, heralding him as better than Ronald Reagan. That is, until Donald Trump appeared on his white horse. Now, her hero worship has shifted to the Donald. Did I miss something? When was Trump elected? Has he actually done anything yet?